The dinosaurs were the dominant terrestrial vertebrates until they abruptly disappeared 65 million years ago. The Triassic: Origin of Dinosaurs. Dinosaurs arose about 235 million years ago, when all the continents were joined together. The Jurassic: Golden Age of the Dinosaurs. The largest of all dinosaurs, the huge plant-eating sauropods of the Jurassic were longer than a football field. The Cretaceous: Triumph of the Chewers. A key innovation of Cretaceous dinosaurs was the invention of chewing teeth. Extinction of the Dinosaurs. The impact of a comet 65 million years ago brought the age of dinosaurs to a close. Dinosaurs had a variety of unique skeletal and physiological characteristics. Key Dinosaur Characteristics. 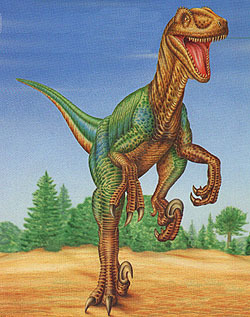 Dinosaurs were the first vertebrates to stand fully upright, making them agile swift runners. Dinosaur Physiology. While early dinosaurs were probably ectothermic, later dinosaurs are thought to have been endothermic, as their descendants the birds are today. Dinosaurs can be categorized into six basic body designs. Sauropods. Sauropods were massive, barrel-shaped plant eaters, some weighing up to 89 tons. They walked on four pillar-like legs and had long necks counterbalance by long tails. Theropods. Theropods were meat-eaters with sharp slicing teeth. They walked on their hind two legs, using their forearms to grasp prey. Ornithopods. Huge plant-eaters with chewing teeth, ornithopods replaces sauropods, which had to use swallowed rocks to grind plants in their stomachs. Armored Dinosaurs. The size of battle tanks, their bodies encased in armor, these were the most diverse of all dinosaurs. Stegosaurs. Plant-eating dinosaurs of the Jurassic, stegosaurs used large, bony plates to dissipate heat. Horned Dinosaurs. The last great group of dinosaurs to evolve, they defended themselves with long sharp horns, much as a rhinoceros does today. The most successful terrestrial vertebrates. This Deinonychus, had one of the largest brain for body size of any dinosaur, was a highly effective predator, and killed its prey with a large razor-sharp claw on its rear feet.Dinosaurs are the most successful of all terrestrial vertebrates (figure 45.46). They dominated life on land for 150 million years, an almost unimaginably long time—for comparison, humans have been on earth only 1 million years. During their long history, dinosaurs changed a great deal, because the world they lived in changed—the worldÕs continents moved, radically altering the earth’s climates. Thus we cannot study dinosaurs as if they were a particular kind of animal, describing one “type” that is representative of the group. Rather, we have to look at dinosaurs more as a “story”, a long parade of change and adaptation.In this overview, we will examine a variety of very different kinds of dinosaurs, animals that lived at different times, adapted to very different worlds. First, we will trace the history of the dinosaurs, and try to get a sense of the evolutionary forces that so changed the dinosaurs as they evolved.